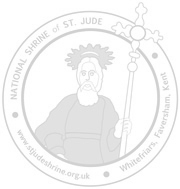 At 1pm today, the Shrine of Saint Jude will heading on its first ever pilgrimage to Canterbury. Canterbury has been occupied since Paleolithic times and served as the capital of the Celtic Cantiaci and Jute Kingdom of Kent. Many historical structures fill the area, including a city wall founded in Roman times and rebuilt in the 14th century, the ruins of St Augustine's Abbey and a Norman castle, and the oldest extant school in the world, the King's School. Modern additions include the Marlowe Theatre and the St Lawrence Ground, home of the Kent County Cricket Club. We will be heading to one of the most famous cathedrals in the world: Canterbury Cathedral. If you would like us to leave a petition at the Shrine of Saint Thomas Becket, please visit our page. Founded in 597, Canterbury Cathedral was completely rebuilt from 1070 to 1077. The east end was greatly enlarged at the beginning of the twelfth century, and largely rebuilt in the Gothic style following a fire in 1174, with significant eastward extensions to accommodate the flow of pilgrims visiting the shrine of Saint Thomas Becket, the archbishop who was murdered in the cathedral in 1170. On our arrival, Mass will be celebrated by Fr Kevin Alban, O.Carm, Prior Provincial with Fr Ged Walsh, O.Carm. Afterwards, we will be visiting where the old Shrine of Saint Thomas Becket stood before it was destroyed (pictured) and then we'll take a look at where he was murdered. We will then be off to some more pilgrimage stops on the way back to Faversham. Read more about pilgrimages to Canterbury.